As soon as I saw this design I was definitely interested. 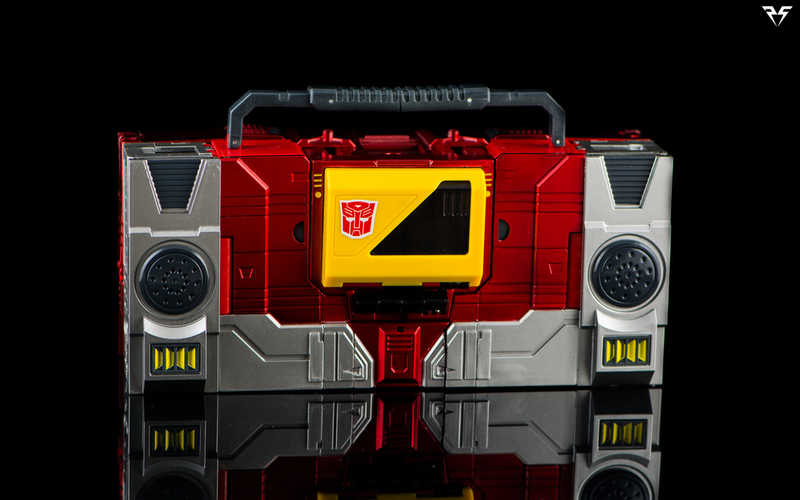 I'm a big fan of the Cassette player bots Soundwave and Blaster but I was a bit hesitant as I've heard some iffy things about KFC in the past regarding their product quality. After a few decent reviews and seeing some amazing photos and development I decided to pull the trigger and take the plunge. 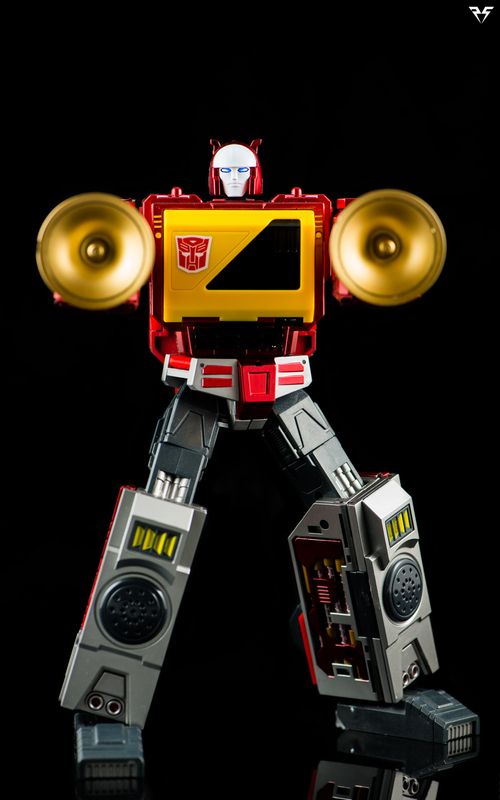 His overall Aesthetic is designed to fit in with your Masterpiece shelf and specifically to be a companion piece to MP13 Masterpiece Soundwave. Transistor has a fantastic design and great engineering. I feel the plastics used are a little light feeling compared to official Hasbro and Takara products but satisfying enough. He does however suffer from having no die cast at all. Some die cast content in the feet like MP Soundwave at the very least would have been a great addition. He scales well with Masterpiece figures and definitely shares a lot of design cues with Masterpiece Soundwave. Transistor is a Masterpiece in scale and design, but more on par with Hasbro’s consumer level figures in construction. He is painted in a gorgeous metallic red that unfortunately has a pretty rough flaking and chipping problem around the joints and tab in points. So far mine is OK but a few more transformations and I could be concerned. This seems to be a pretty widespread issue. My recommendation would be to take it easy when transforming, or even forego transformation all together. As a display piece this really isn't an issue, but if you were looking for more of a "Toy" you might be disappointed after a bit of play time. The first orders come shipped with 2 speaker/trumpet cones that can be plugged into pegs on the rear of the wrists. He also came with a set of articulated hands identical to his in blue for Masterpiece Soundwave. He comes with 2 copies of his sonic rifle and a second, Comic book inspired head sculpt. To be honest I feel the comic head sculpt has a lot more attention to detail and love put in to it. It’s even the one they present on the box. 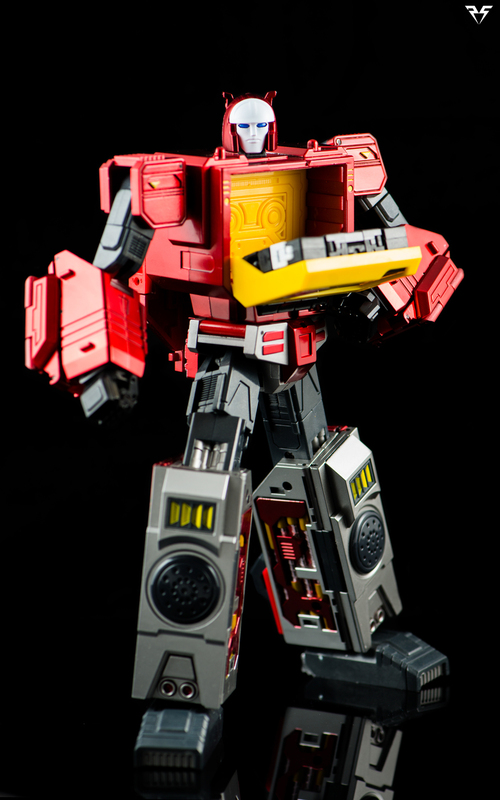 Unfortunately the comic style head is a little wide at the ears and can not comfortably fit in the storage bay designed for it when in Tape Deck mode. The head can be made to fit but I feel it rubs far too tightly and I'm concerned for the paint. 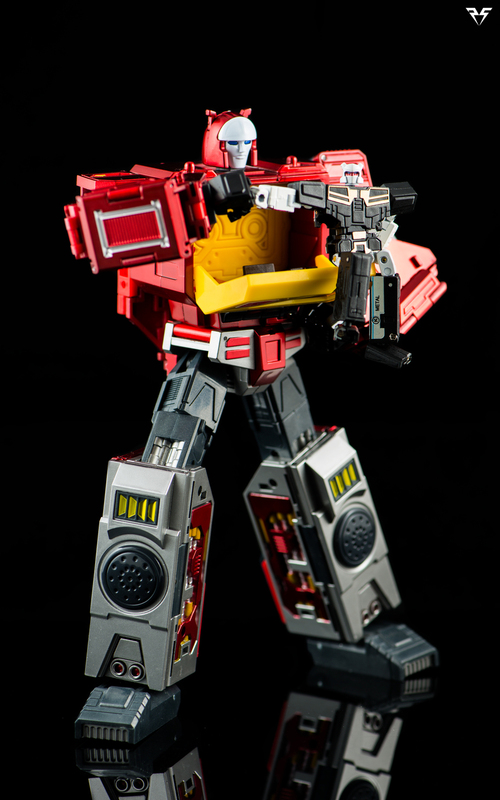 He also ships with Hi-Fi, KFC’s version of G1 Rewind. Hi-Fi has a great design and decent build quality on par with the other MP cassettes. The paint job on Hi-Fi seems to be a bit hit or miss, some recipients have been very vocal about poor paint that has been sloppily applied or feels like it was packaged while still wet. My Hi-Fi is in pretty good shape and the paint is certainly acceptable but it does seem like a cheaper quality paint may have been used for his white painted parts. That being said if you are lucky enough to get a good one he is a very nice little figure. 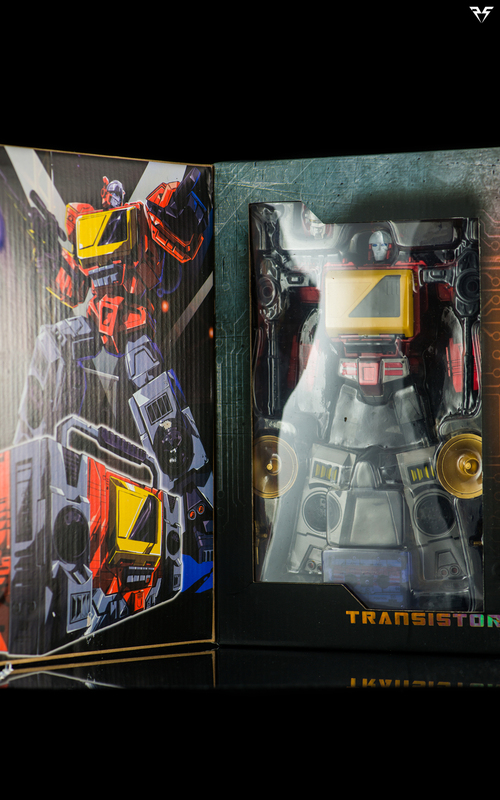 As a bonus he also comes with 2 extra IDW inspired heads, one with the camera and one without. He also has 2 gold blasters and a purple cassette case. 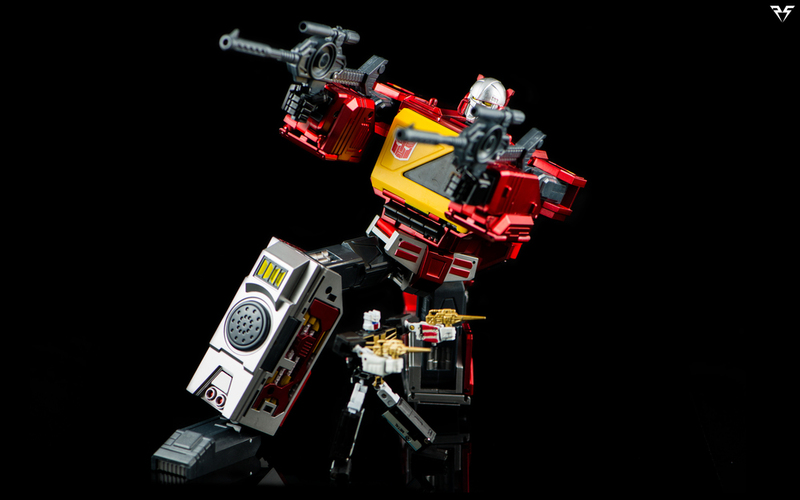 All in all I would say he is an excellent figure and a great representation of Blaster for your Masterpiece Autobot shelf… Definitely a display piece rather than a toy. 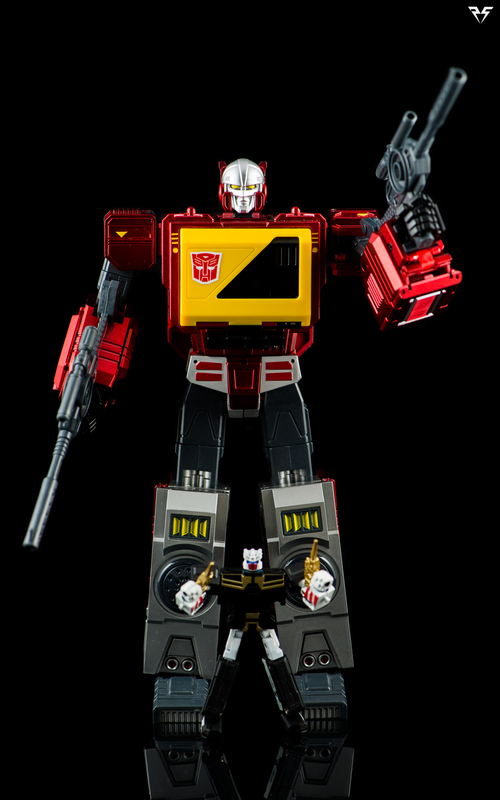 I have no doubt in my mind that once Takara makes an official Blaster I may be finding this guy a new home but in the mean time I am very happy to have him join my ranks.